The Observer newspaper in the UK has this weekend published a story centered on tobacco giant Philip Morris and it's relationship with Tory election strategist Lynton Crosby regarding plans to introduce plain standardised packaging in the UK. Confidential documents leaked to the Observer reveal how the world's largest tobacco company sought to kill the government's plans to introduce standard packs for cigarettes, using a sophisticated lobbying campaign that targeted key politicians and civil servants who it believed were supportive of its views. Documents circulated within Philip Morris International (PMI) last February and March, marked "for internal discussion and illustration purposes only", show how the owner of the Marlboro brand drew up an astonishingly detailed attack plan to "ensure that PP [plain packaging] is not adopted in the UK". This goal explicitly contradicts big tobacco's public position, presented to the government, that there was a need to assess how the measure had been received in Australia, where unbranded packs were introduced last year, before a decision was made on whether it should be copied in the UK. The tobacco lobby fears that if the UK were to introduce plain packaging, other countries would not be far behind, and it has spent millions of pounds seeking to derail the proposal. PMI's role in lobbying government is now under acute scrutiny after it emerged that last November that it hired the Conservative party's election strategist, Lynton Crosby, who has extensive tobacco industry connections, to help it make its case against plain packaging. Crosby has denied having any conversations with the prime minister about plain packaging. The PMI documents reveal that, in a bid to swamp the Department of Health's consultation exercise on plain packs with supporting arguments, the company boasted that it had the "potential" to help generate more than 18,000 responses, including 6,000 from its recruited group of smokers, 950 from industry, 10,050 from its "retail group", 40 from thinktanks and 1,000 from a trade union, believed to be Unite. The internal documents reveal how, over the past year, PMI sketched out a timeline for rolling out its key messages. These included the claim that plain packs would make the illicit trade in tobacco worse and the need for the UK government to "wait and see what happens in Australia [for two or three years] before walking into the unknown with no evidence it will reduce smoking". The latter message was echoed by the government when it announced that it was abandoning the plan to introduce plain packs. The Department of Health's statement said: "The government has decided to wait until the emerging impact of the decision in Australia can be measured before we make a final decision." The Government is facing the fury of health campaigners after plans for plain packaging for cigarettes were put on ice while it emerged minimum pricing of alcohol will be killed off altogether. Health Secretary Jeremy Hunt said a decision on whether to go ahead with plain packaging in England would be postponed until ministers had had a chance to assess the impact of a similar scheme introduced last year in Australia. Meanwhile, it was reported Home Secretary Theresa May will formally confirm next week - before MPs finally break for the summer - that the Government has dropped plans for minimum pricing of alcohol in England. Downing Street denied the Tories' elections strategist Lynton Crosby - who has been linked to lobbying by the tobacco industry - was responsible for the delay to plain packaging. However, there was widespread suspicion that he was behind the decision - even among some Tory MPs. Mr Crosby, who was brought in last year after masterminding Boris Johnson's re-election as London mayor, has reportedly advised David Cameron to "get the barnacles off the boat" and concentrate on the core concerns of voters such as the economy. Conservative backbencher Sarah Wollaston, a GP who has campaigned for both plain packaging and minimum pricing, said the result would be more lives ruined for the sake of political expediency. "RIP public health. A day of shame for this government; the only winners big tobacco, big alcohol and big undertakers," she wrote on her Twitter feed. "What a tragic waste of an opportunity. 'Barnacles scraped off the boat' AKA more lives ruined for political expediency." A Downing St spokesman insisted Mr Crosby had no involvement in the decision on plain packaging although he acknowledged that he did take part in meetings in No 10. "He is not employed by the Government. He is employed by the Conservative Party as an adviser to the Conservative Party. He doesn't have a pass for Downing Street. He doesn't have a desk at Downing Street. Does he attend meetings at 10 Downing Street? Yes, he does," the spokesman said. Shadow cabinet office minister Jon Trickett has written to Mr Cameron demanding "clear and unambiguous" answers about how the decision was made. He wrote: "Suspicions have been raised that the change in policy has been influenced by your election strategist, Lynton Crosby, who has reportedly worked as a lobbyist for clients in the tobacco industry. You have repeatedly been given the opportunity to allay these suspicions, and have consistently failed to do so. Instead, you have been evasive, answering questions which you were not asked or refusing to respond to questions altogether." He added: "Until you give clear and unambiguous answers to all of the straightforward questions that have been put to you, suspicion will remain that you have something to hide. If you have never discussed tobacco or alcohol policy with Lynton Crosby, and if he no longer has business links with the tobacco or alcohol industries, why won't you just say so?" To read this article in from source, click here. This morning, the BBC reported that the UK Government are to put plans to introduce standardised packs on hold. The government is to postpone its plans to introduce standardised plain packaging for cigarettes in the UK. Ministers are expected to tell MPs that a decision on the policy has been formally delayed so that more time can be spent examining how similar plans have worked in Australia. The aim of such packaging is to discourage young people from smoking by making the packets less attractive. Cancer Research UK said the government had chosen tobacco profits over health. The packets would all be the same colour, with the same font and carry a prominent graphic warning. Ministers were keen to go ahead with the proposal after the Department of Health held a consultation last year. Australia was the first country in the world to introduce such packaging when it did so in December 2012. The only concession in Australia to the tobacco companies is their name and the name of the brand variant in small print at the bottom of the box. Cancer Research UK chief executive Dr Harpal Kumar said the decision would cost lives. "The government had a choice: protect children from an addiction that kills 100,000 people in the UK every year or protect tobacco industry profits," he added. “We are hugely disappointed that the opportunity has not been taken to signal that first step towards the introduction of ‘plain’, standardised packaging of tobacco products. “Currently in the UK there are no restrictions to the way tobacco multinationals are allowed to promote their brands through packaging. In the South West alone, 45 children start smoking every day. Introducing standardised packs is about protecting our children and adding another effective measure to protect them from sophisticated tobacco marketing and to neutralise the current use of attractive packaging to recruit the next generation of children into a lifetime of addiction. “The introduction of standardised packaging for cigarettes and tobacco products would be an important step in cutting the number of children who start smoking every year. Children in poorer communities, and in vulnerable groups such as those in care, are particularly likely to become smokers. That government is stepping back from this change is a sad day for child protection and child health. We believe that Parliament should have the chance to vote on the issue as soon as possible”. Talking cigarette packs to help or hinder health efforts? Talking cigarette packs may help smokers to quit, a piece on the BBC website reported yesterday. Cigarette packets that play recorded messages urging smokers to quit have been created by researchers at Stirling University. The packets play audio clips giving warning messages about the dangers of smoking when they are opened. 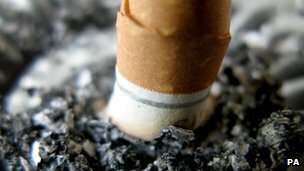 The recordings warn of the link between smoking and fertility as well as a helpline number to help quit. They are said to have worked will during tests carried out on a group of women aged 16 to 24. The study is set to continue, with tests on bigger groups of males and females, aged 16 and over, about to begin. Crawford Moodie, part of the team who invented the packs at Stirling University, said: "Tobacco companies may use talking packets in the future as part of marketing. "This research shows how the idea can be used to promote 'positive health' to smokers." Sheila Duffy, from anti-smoking charity Ash Scotland, said: "I welcome the suggestion that we get more creative to put forward messages of good health and freedom from addiction as alternatives to tobacco. "We need accurate research to assess the potential impact of any new packaging ideas on people of all ages. "This latest research, involving young women who smoked, did not suggest that such packaging innovations made cigarettes more attractive to them." Alison Cox, from Cancer Research UK, said her charity had funded the Stirling study in a bid "to see if the marketing tools of the tobacco industry can be used to help smokers quit instead". The Scottish government earlier this year pledged to support standardise tobacco packaging, in an effort to help people stop smoking. Public Health Minister Michael Matheson also set a target to reduce the number of smokers in Scotland from 23% to 5% by 2034.